There are so many different tropical locations throughout the country of Mexico to have your destination wedding! When we first moved to Mexico, we couldn't believe anywhere could be as stunning as Los Cabos with its dramatic waves and desert landscapes. Then we began photographing weddings in Cancun and the Riviera Maya and were amazed at the beauty of its calm turquoise waters on the Caribbean sea. Tulum captured our hearts with its hip vibe & swimmable white sand beaches. Driving the long windy road to Punta Mita for the first time from the cute colorful town of Sayulita, we wondered what it would be like. We weren't disappointed! The beachfront village of Punta Mita is surrounded on three sides by the Pacific Ocean with acres of beautiful private beaches, hidden coves, and swaying palm trees - the perfect backdrop for your Mexico destination wedding. Punta Mita is also home to the most luxurious hotels in Mexico: The St Regis Punta Mita, the Four Seasons Punta Mita, and the new W Punta Mita. Popular with many stars like Lady Gaga, Kanye West, Charlie Sheen, Gwyneth Paltrow, James Marsden, and Kim Kardashian, it is an extravagant location to be pampered like a celebrity on your Mexico destination wedding. 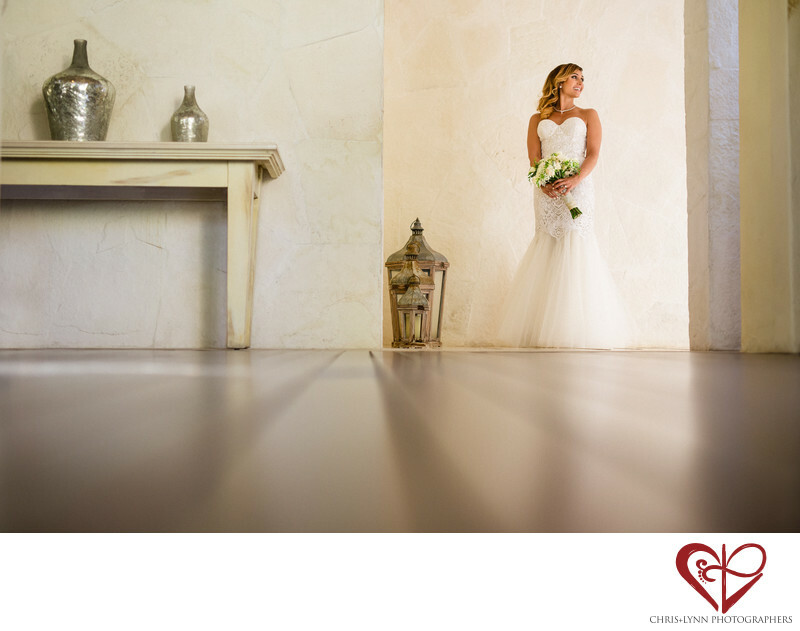 I love the serenity of this bridal portrait. It perfectly reflects her calm happiness as she waited to see her husband-to-be for the first time. She is glowing! The bride had taken lots of time to get ready, enjoying the leisurely process in her bridal suite. Having photos of herself and of her and her groom together at the St Regis was very important to her, and she made it a priority to allocate lots of time prior to the ceremony for photos. This way she could enjoy some private time with her groom and not feel rushed after the ceremony trying to squeeze in portrait time with family photo time with cocktail hour celebration time. For this portrait, Chris actually lay on the floor of an entry way in the spa. I'm pretty sure the attendants thought he was crazy! He wanted to add interest to the image by incorporating the shimmer of the floor and using the lines of the floorboards to lead the eye. I love this Persian bride's gorgeous dress by Naeem Khan, her delicate bouquet, and her smile of anticipation. This bridal portrait image and many more from this luxury wedding was featured in the print issue of Perfect Wedding Magazine. 1/320; f/1.8; ISO 400; 50.0 mm.